Internet connectivity providers may restrict the way in which their networks are used. The Acceptable Use Policy defines the rules for using the network. See IP Address or E-Mail Address. Some FTP sites allow users to use the word "anonymous" as a User ID and their e-mail addresses or "guest" as a Password when they log in. This allows the users to bypass local security and gain limited access to download public files on the FTP site. This type of access is not available on all FTP sites, and may be restricted to a maximum number of anonymous users on others. See File Transfer Protocol. A security process for ensuring user identity. The most commonly seen method of authentication is the entry of User ID and Password for access. Bandwidth is often loosely referred to as the amount of data which can be sent through a network connection, and is usually measured in bits per second. It actually refers to the difference, measured in Hz, between the lowest and highest frequencies of a given transmission. Commonly used to refer to modem speed, measured by how many bits it can receive or send per second (bps). Binhex is the common acronym for BINary HEXadecimal. It refers to a method for converting non-text files into ASCII files. This conversion method is used most often with Macintosh files. When a user sends e-mail and it fails to reach the recipient for any reason (for example, an incorrect address, network failure, etc. ), the message will return to the user - it "bounces" back. An undelivered e-mail message will usually come back with a subject line saying something like "Undeliverable Mail" or "Message Undeliverable." Software that allows a user to look at various Internet resources. For example, Netscape Navigator is a World Wide Web browser, and NewsWatcher is a Use Net (News) browser. A common acronym used in online communications meaning "by the way." Acronym for "Common Gateway Interface." CGI is a set of rules describing how a World Wide Web server communicates with other software on the same machine. For example, a CGI program may be used to take data from the Web server and use it in a database search query. A program used to contact and obtain data from another computer on the Internet. Each Client works with one or more kinds of Server programs. For example, a Web Browser is a type of Client used to access World Wide Web resources. Crackers are users who try to gain illegal access to computers. They may be malicious or merely curious in their intentions. See Hacker. A term coined by fantasy writer William Gibson for the "world of computers and the society that gathers around them," and used ad nauseum  by government, marketing, and other buzzword gurus. DEKs are used to encrypt and decrypt message text. They are a form of data security often used in e-mail to keep messages from being read by others than the intended recipient. A common encryption program is PGP (Pretty Good Privacy). A communications line used solely for computer connections. For example, a second telephone line added to a user's home for modem use is a dedicated line. Larger network entities such as Internet providers use special types of dedicated lines like T1s and T3s for high speed, high volume connections. A Dialup Connection is a common method of accessing the Internet that uses phone lines to connect computers via modem. Your SkyPoint account is a Dialup account. Domains are "regions" on the Internet, sometimes referred to as "sites." A Domain usually corresponds to an IP Address or an area on a Host. A Domain Name identifies an Internet site, and consists of at least 2 words separated by dots. For example, "skypoint.com" is a Domain Name. E-mail is a method for sending and receiving messages between users over a network. An e-mail address is made up of several parts. The first part, the User ID, identifies a unique user on a Server. The "@" symbol (pronounced "at") separates the User ID from the Host name. The host name identifies the server computer. For example, your e-mail address ends with the host name "skypoint.com." By convention, e-mail addresses are written in all lowercase letters with no spaces. Encryption, a security measure, encodes data sent over the Internet so that it may only be decoded and used by the intended recipient. Acronym for "Frequently Asked Questions." FAQs are large, informational text files written by users who are knowledgeable about a particular, usually specialized subject and find it easier to record the answers in a document rather than answer the same questions over and over. FAQs are available on many FTP sites, World Wide Web pages, and News Groups. FTP is the most common way of uploading (putting) and downloading (getting) files on the Internet. It can be used with a series of commands in a text-based system or through a graphical software application such as Fetch or ws_ftp which simplifies the process. 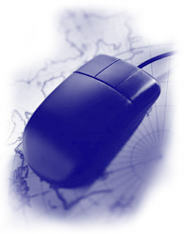 Many Internet sites have archives of information and other materials accessible by FTP. A negative response to an e-mail or news group posting. Flaming once was a linguistic art form involving flowery and often sarcastic language, but has recently degenerated into any sort of passionate derogatory response. They now may include any response from an impassioned negative oratory, to a crude comment, to a mail bomb. Some online discussions degenerate into a series of flames against the debators rather than their positions. A flame war will generally shut down a meaningful discussion for days at a time until the participants tire of the activity. Typically used in its nontechnical meaning, a mechanism for providing access to another, dissimilar system. For example, some non-Internet online services such as Prodigy now provide some Internet access. That service access would often be referred to as a gateway to the Internet. The correct meaning is any hardware or software that translates between networks that normally could not communicate. For example, a company network's internal e-mail format might be translated into an Internet e-mail format for outside communications. The translation mechanism is a gateway. A menu-based search and retrieval tool used for research. Gopher sites store information much like FTP sites. Some common search tools are Veronica and TurboGopher. A user with in-depth understanding of computers, networks, and the Internet. Often mistakenly seen as malicious, Hackers are known for technical wizardry in doing things on a computer system that most people would find difficult, unlikely, or impossible. The main World Wide Web Page of a person, organization, or business. A computer on a network or the Internet containing services available to other users. Users communicate with hosts using client programs such as Web browsers. Acronym for HyperText Markup Language. HTML is the coding language used to create hypertext documents for use on the World Wide Web. The codes indicate to a Web browser how the text or graphics should appear, and which text should be linked to another file on the Internet. Acronym for HyperText Transport Protocol. HTTP is a protocol for moving hypertext files across the Internet. It is the most important protocol used in transferring files across the World Wide Web. Text, either words or phrases, that contains links to other files on the World Wide Web. Selecting this text will cause the other document to be retrieved and displayed. A uncontrolled, unadministered collection of networks using TCP/IP protocols. It is not an organization, corporation, or other entity. The moment a user logs on, he or she becomes a part of the Internet. It is also sometimes known as the "Net." Any time two or more different networks are connected, they form an internet. This usage of "inter" is similar to its usage in "interstate" or "international." A company whose network is linked to the Internet through a dedicated communication line (usually a high speed line like a T1) and which offers the use of other dedicated communication lines to companies or individuals to access the Internet. A user will commonly dial up an ISP whose computers will connect him or her to the Internet for a fee. SkyPoint is an ISP. A private network for internal use within an entity such as a company that uses similar software to that found on the Internet. For example, some companies create Web Pages on their networks accessible only by their employees. Every Internet resource has a unique numerical IP Address, similar to having a telephone number. The IP Address consists of 4 parts separated by dots, such as the SkyPoint address, 199.86.32.2. When software "calls" the IP Address, it is connected to the computer that owns the number. Acronym for Internet Relay Chat. IRC is a "party line" where users can "chat" in real-time by typing their comments to each other. Acronym for Integrated Services Digital Network. A way that telephone companies can increase the amount of data transmitted over regular telephone lines. In contrast to the highest (current) available speed over standard analog phone lines of 38,800 bps, ISDN lines can transfer data at up to 128,000 bps. A programming language specifically designed for writing programs that can be safely downloaded from the Internet and run without danger of harm from viruses or other sources. Small Java programs, called "Applets," can be used to add fancy functions to World Wide Web Pages such as animations and calculators. A telephone line that is rented exclusively 24 hours, 7 days a week for communication between fixed locations. High speed connections such as T1 and T3 lines require a leased line. Noun: the User ID that allows a user to gain access to a computer system and that identifies his or her account to other users. Verb: the act of entering a computer system during authentication. Passively watching the conversation on an IRC channel, in a News Group, a mailing list, or any other applicable Internet communication device. Beginners often lurk in order to get up to speed on what is occurring in the communications group or learn the group's etiquette. A large number of e-mails or a huge e-mail sent with malicious intent to clog a user's e-mail box. Mail bombs are often sent in reprisal for a breach of netiquette. A list of e-mail addresses for mass mailings. Often used for semi-private communication by members on the list. Some World Wide Web Pages and FTP sites have become so popular that users have trouble connecting to them because of the high traffic volume. The structure of and information on those sites is often duplicated on Mirror Sites so that users can access the information elsewhere. A person who manages moderated News Groups or mail lists. A moderator can decide whether a message is appropriate to the forum and allow it to be posted, or later remove it. Acronym for Multi-User Dungeon, Dimension, or Domain. A text or graphically based multi- user environment where users can engage in games, communication, or any other activity a group of users might imagine. One significant feature of a MUD is that users can create things that remain after they leave and interact with others in their absence, so that the "world" is built collectively over time. A network is created when 2 or more computers are connected together so that resources can be shared. The name for discussion groups on the Usenet. Each news group is dedicated to a certain subject. As of January, 1997, over 20,000 News Groups existed on the Usenet. Acronym for Network News Transfer Protocol. A standard protocol used for the distribution, retrieval, and posting of news articles on the Usenet. A standard unit of data sent across a network. A code, known only to the user to whom it belongs, to gain access to a locked system. A good password should contain both letters and nonletters, and should not be easy to guess either based on information about the User or because it is a short, simple combination. Acronym for Packet Internet Gopher. The easiest way to tell if an Internet connection has been made or to time one's response is to send a PING (a request) to the Internet host and wait for a PONG (a reply). When an address is PINGed, the response will include the number of seconds it took to make the connection. Acronym for Post Office Protocol. POP refers to the way that e-mail software like POPmail gets mail from a mail server. Sending an article to a News Group. Acronym for Point to Point Protocol. A communications protocol that lets a computer use a telephone line and a modem to make TCP/IP connections and become part of the Internet. Your SkyPoint Dialup account uses PPP. A "language," a set of formal descriptions of message formats and transmission rules, spoken by computers to help them exchange information. A computer that provides network services such as files or World Wide Web resources. A single machine may have several different server software packages running on it, thus acting as several servers on the network. A file that can automatically be attached to the bottom of e-mail or a News Group posting that identifies the sender. Many users use a variety of characters to make their signatures more distinctive, or include a favorite quote or means to communicate outside the Internet. Acronym for Serial Line Internet Protocol. A standard for connecting a computer to the Internet as a real Internet site using a modem and a telephone line. SLIP is gradually being replaced with PPP. Acronym for Simple Mail Transfer Protocol. SMTP is an e-mail transfer protocol. It transfers mail from server to server, and an end-user transfers mail to his or her machine from the server using POP. Spamming is an inappropriate use of a mail list or other Internet communications medium for "junk mail" mass-broadcast. A common form of Spamming is posting messages to a large number of News Groups where the post's content is inappropriate to the News Groups' subject matter. Leased-line high speed connections. A T1 line is the most common line used in connecting networks to the Internet. A T3 line is approximately 40 times faster than a T1 and is capable of carrying full-screen, full-motion video. Acronym for Transmission Control Protocol/Internet Protocol. TCP/IP is the standard communications protocol required for Internet computers. The command and program used to login from one Internet site to another. Acronym for Uniform Resource Locator. A URL is the standard way to write the address of a World Wide Web Page. Users enter URLs into a Web browser as an "address" for a particular page. For example, SkyPoint's World Wide Web page is found at www.skypoint.com. Usenet is a world-wide system of discussion groups (News Groups). It is completely decentralized, with messages passed between hundreds of thousands of machines. As of January, 1997, over 20,000 News Groups existed on the Usenet. The Web is a collection of hypertext servers and the documents they house. To access these files, a user needs a Web browser. When a browser accesses a page, the server uses HTTP to send the document to the user's computer. These documents may include text, graphics, sound, and video.